Here we have a somewhat revised version of Editorial0’s Star Wars vehicle design rules, tweaked for clarity. This system provides a generic but effective way to generate vessels in Star Wars (d6) or any d6 game, not that anybody ever played one except Star Wars. The rules are abstract to some degree: your character may obsess over the difference between Slayne-Korpril mk 6.2 engine (Starfighter remod) versus customized Sluys Bumblebee 9’th generation model made under contract by Varynis corporation. You, however, pick what the vehicle actually does. There are trade-offs. Even the Millennium Falcon doesn’t have the best of everything. Nobody can fit all the weapons, engines, and defenses on the vehicle they would like. They have to pick what matters most. Steps 1-4 are required. However, everything else is optional. Hulls come rated in size categories. These are particularly important in determining the overall cargo and passenger space inside the vehicle and especially the energy output of the power plant. Each size within a range corresponds to a specific vehicle scale, which makes Hull size very important in combat. For now, don’t worry about how many people you can fit into the ship or similar worries. Assume it has bunkrooms for the crew and enough space for its primary purpose. You can check the Passenger Slots options later for a more detailed system. Every Vehicle has a Life Support option, at least as a primary pick. Choose whichever is most appropriate for free. You can have more than one, in fact. Extras are called Add-ons. They’re not required, but they are fun. Note that Open and Unsealed vehicles don’t get any price break. There’s a simple reason for this: if sea or space travel is normal in a game, it’s also commonplace and required. Thus any reasonable player vehicle needs that capability. On the other hand, players might acquire or be stuck with an airplane or sailing ship and have to deal with its limitations. You can save on Power by choosing an expensive Add-on first (getting it for free) and then tossing on Space. That’s fine. But you may want to upgrade a vehicle, and in the case of Open and Unsealed, you get no special bonus for doing it this way. You’re making a clunky upgrade to an existing vehicle, not making your awesome spacecraft into a personal showpiece. Open: Open vehicles have no life support and offer no protection whatsoever from the elements. The pilot and any passengers, droid or biological, have no protection from damage and no defense against whatever dangers may be present. As an Add-on, it lets the vehicle almost totally collapse, granting a +1d6+2 Coolness bonus on relevant social checks, for 30 Power. Yes, it’s expensive. Turning your starship into a personal ATV is like that. Unsealed: Unsealed vehicles offer only minimal protection, but this is often more than enough for simple ground vehicles which don’t or can’t get into very dangerous conditions. They do help protect against crashes. As an Add-on, it gives the vehicle collapsible section granting a +1d6 Coolness bonus on relevant social checks for 15 Power. As an Add-on, it costs 10 Power. Seaworthy: Seaworthy vehicles can easily cross bodies of water without damaging exposed components or sinking. This is not necessary for repulsorcraft or other flying vehicles, as long as they don’t actually try to land in water. Submarine: Submarine vehicles are fully environmentally sealed and resistant against crushing force. They will not leak easily and can dive to considerable depths without a problem. As an Add-on, it costs 20 Power. It’s mildly expensive because it’s not all that common and grants a number of unique options and tricks. Spaceworthy: Spaceworthy vehicles can easily travel without an atmosphere, and will not be damaged by the lack of pressure and atmosphere found in deep space conditions. They are resistant to all common space dangers, including the radiation found in planetary orbit or deep space, common nebular conditions, and micro-meteorites. They carry enough life support for any reasonable number of passengers indefinitely. As an Add-on, it costs 10 Power. It’s cheap because if it’s in common use, it’s almost required. You can buy up to average vehicles most places, good anywhere middle-class and up, excellent from high-end dealers. Legendary vehicles cannot be bought: you have earn the legend the hard way. Most mass-produced government-issue military gear is Cheap or Average, while an old or beat-up unit owned by a smuggler who enjoys performing maintenance and upgrading parts can easily be Excellent, and a spare freighter scrounged up struggling rebellion is Junker. It’s possible to refit a vehicle, and the cost is basically dependant on the game. If money is important and resources tight, then improvement becomes costly – the characters have to work for it. If playing more adventurous games, just hand the players really good vehicles if they like, or let them pay 20 XP to upgrade one step. Power Plants require a certain level of technical skill to operate, which is why they’re separate from the Base Power listing. This is the benefit out get for having a skilled operator who knows his craft inside and out. On the upside, you get the best skill of several options. Use your best skill from the appropriate piloting skill or Power Plants. Even if your vehicle doesn’t use a power plant, assume something else fits. Whether you’re taking a Chariot around or sailing a yacht, it’s the same bonus. Thus, a Legendary vehicle with an Amazing power plant has 240 power. Of course, only something like the Millennium Falcon – and then maybe only after Han became an important Rebellion figure – would have this level of goodies. Now decide your Atmospheric and Space Move. Vehicles which can only operate in Atmosphere (or under water) work a bit differently. Take the Move rating chosen above. Multiply it by ten minus the Base Hull Number (ignore the die code portion; just take the number). This is your Atmospheric Move. If you have 0 or negative move, your ship is very slow and isn’t designed to casually land, or even enter atmosphere in most cases. You are considered to have a -2d6 penalty on maneuverability, making you a sitting duck. If you want to purchase a higher value, use the table following table. Whether you calling it using “Jumpgates” or “Riding the Dragon”, you can now determine your long-term movement modifier. A class-x2 or x3 Hyperdrive is fairly common in Star Wars for short-range civilian craft. Most traders and military vehicles have a class-x1 Hyperdrive. The Millennium Falcon has a class-x0.45 Hyperdive. You also get a backup Hyperdrive at X15 for free. Hyperdrives may or may not be important in a game. If your Game Master doesn’t want to worry about the hassle, just ignore this step. Hyperdrive speed never made any difference in the movies, after all. Unlike Hull rating, shields must be deliberately placed at each attack angle: front, rear, left and right. However, you only buy total rating, and can vary the shields out of combat or in-combat with a Shields check. Each sector covers a three-dimensional arc, so only four angles are needed. Some alien species divide their shield space differently, but the end result is the same. However, you don’t have to purchase this for each individual weapon. That is, your ship may have fifty turbolasers and a hundred ion cannons. But you only buy one turbolaser attack and one ion cannon attack, or even only one attack total! Remember, you’re purchasing capabilities, not weapons. In Star Wars, this mostly means you have a variety of weapons. This also neatly explains why the Death Star was vulnerable to fighters. They evidently put most of their points into weaponry do they could do damage even above their 24D base scale (a planet would be at least 36D). Thus, they stripped defenses and fire control thinking it wouldn’t matter! 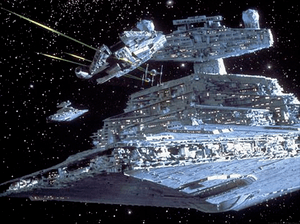 Then, they couldn’t use their firepower on the high-maneuverability fighters of the Alliance. I’m not quite sure what this means when you’re only purchasing an overall capability per weapons type. I’ll see if I can get some additional clarification here. You may wonder why anyone would take Projectile weaponry, since it’s not very useful. In Star Wars, most projectile weapons use the Laser/Blaster/Ion class because you’re firing semi-liquid and/or super-heated bullets of ultradense death. It’s there because the players might be stuck with old or cheap weaponry and have to compensate, or just do their best and muddle through. Here is a list of some fun things to include in your design. First on our list is the Passenger Berth listing, because many of the extras here use these. Passenger Berths don’t take Power, but rather use up Passenger Slots. Each size category gets a certain number of slots, and most vehicle designers don’t like pushing things to the absolute maximum. These include supplies for 1 person for one month per berth. As mentioned above, you don’t need to worry about basic crew accommodations. Unfortunately, there’s no easy answer formula for determining how many Passenger Slots you get. The following table gives some guidelines, but there’s just a huge difference between different kinds of ships in the same class. Freighters would have plenty of space for these if someone wanted to retrofit them in, but a troop transport or hotel ship would have them built in. Many warships don’t have lots of Passenger Slots. Ultimately, it’s a judgment call. Ordinary berths are unexceptional, but decent. They include a small bed, a little heating pad for cooking or access to a central cafeteria, and some kind of bathing facility. Takes 2 Slots. Comfortable rooms are nice and have space to stretch out. Facilities are complete, clean, and may have droid service. A good traveler’s room would be a Comfortable berth. Takes 3 Slots. Luxurious quarters are fantastic. They are the epitome of service and comfort, a fine and relaxing place for any wealthy ship-owner or tourist. Nobility and royalty wouldn’t feel out of place in these lovely rooms. Takes 5 slots and up, up up! Central Droid Command: Rarely used now, but common in the Clone Wars, A CDC system enabled centralized control over hundreds or thousands of droids simultaneously. It requires a Comm System. The advantage is that all droids cooperating on a task gain a +2 bonus to all skill and or attribute rolls. They do not gain this bonus to resisting or inflicting damage, or for any action taken alone. It inflicts a -2 penalty to initiative rolls, as the droids are slowed by waiting for instructions. Costs 20 power. Cloaking Device: Cloaking devices create a warping field effect around the shields which totally blocks all sensors, because the ship simply isn’t there to EM effects. The only sign it leaves is a very slight distortion. Note that the ship needs special internal cooling to prevent overheating, and it is just as blind to the outside world. Requires 100 Power. Extra Armor: Some military ships enjoy layering on the armor and improving the hull structure. This gives the vessel a tougher Hull rating. Requires 75 Power per 1 Hull die. Most ships with this have low maneuverability and sublight speed. Long Range Capability: Devote a few passenger slots (see Passenger Berth, below). Each one grants an extra month of supplies for 5 people (supplies are compact ). This includes rations and water recycling for very long voyages – if characters want gourmet meals and fine wines, they’ll need many more slots. Landing Gear: This actually doesn’t cost anything, but many ships simply don’t have it built in. Very few capital ships have it apart from troop transports. Repair Bay: Repair Bays enable you to make repairs to any on-board vehicles. It comes complete with full facilities and machinery to manufacture almost any part which could go wrong. Treat as a Medical Suite but for repairs instead, with equivalent facilities for damaged droids and vehicles. Secret Compartments: If you even needed to hide some items the local authorities think is very naughty, you need a secret compartment. The base DC to find a compartment is usually 15. Takes 1 Passenger Slot per cubic meter, plus 1 Slot for every 1d6 penalty on the enemy’s check to locate them.